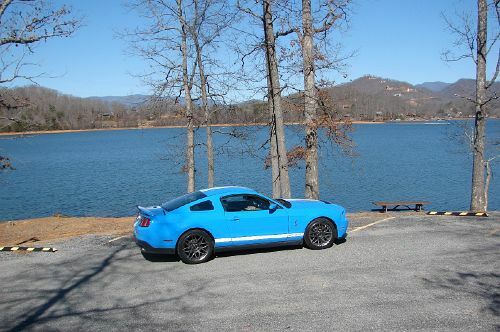 The next day, I took my wife and took the same ride over the mountain into Hiawasee, GA. This little town has some great views in every direction and every view has water in it. What was really cool is that the car is completely street docile and easy to drive, yet, it will set you back in the seat at the crack of the throttle. When you get into it, you can watch the tach climb and the boost kick in on the gauge for the supercharger. Most of the time this gauge registered nothing, but when you put your foot into it, it would show the boost that the supercharger was putting into the engine. By changing pulley sizes, you could add even more boost if you wanted to. With the exception of a few noise issues, there is nothing about this car that I didn't like. The first day that I had the car, I took it out on the interstate and quickly found that I had two state troopers on my tail just waiting for me to exceed the limit. I had to search for a place to let it out a little and found out that you have a hard time finding a place that is long enough to get this thing up to speed. It really eats up the road quick and that is a good thing.